We create an environment that supports, nurtures and calls forth the divine nature and gifts of each person in our Unity family. We offer Spiritual care and outreach to our spiritual community through supportive, compassionate, affirmative prayer, meditation, and mediation services. We recognize our spiritual oneness and unity, celebrate that oneness with joy, and honor it with wisdom and love. We seek spiritual truth and understanding through the study of Unity principles, the Bible and other universal teachings. We open our hearts and minds to receiving God’s guidance and wisdom, through a foundation of daily prayer and meditation. Unity on Greenville enriches the prayer life of our Spiritual Community and those who serve in Spiritual Care. - Participate in Unity on Greenville’s Prayer Chaplain basic training. At the end of this training weekend, you may choose to serve on one or more of the above teams during your 1-yr. commitment. All Spiritual Care volunteers will participate in an installation ceremony during our 11:00 am Celebration Service. - Optional: Participate with other Unity prayer chaplains in our sub-region in the annual Together in Unity Prayer Chaplain retreat. You will be given loving support throughout your service in providing Spiritual care to your spiritual community. 2. Upon acceptance, volunteers will be trained in accordance with the specific requirements of each component of Spiritual Care Services (see below). 3. 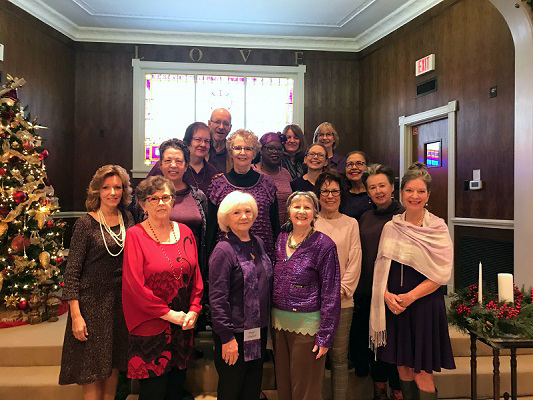 Each volunteer will participate in our annual retreat and training weekends, ongoing monthly training, participate in meetings, and thoughtfully consider annual re-commitment to Spiritual Care service. 1. Participate in the annual Prayer Chaplain Training and the annual sub-regional Prayer Chaplain retreat sponsored by Together in Unity. 7. Optional responsibilities: Hold sacred space in the sanctuary for all board and committee meetings (along with Prayer Team. 3. Ongoing training as needed. 1. Pray over prayer requests after services and throughout the week. 3. Report attendance number and love offering to Administrative Assistant. 1. Training to be a facilitator and/or coordinator is accomplished by attending training through EnVision Ministries (Rev. Scott Sherman). 3. Participate in the annual Prayer Chaplain Training weekend. 4. Optional: Facilitators are invited to attend the sub-regional Prayer Chaplain retreat sponsored by Together in Unity. MORE INFORMATION: See one of our Prayer Chaplains or Rev. Karen Romestan. An experience of supported, healing and empowering prayer. ....as they pray with you following our Sunday Services or on the phone. A Unity Prayer Chaplain is someone who supports you on your spiritual journey…someone who will pray with you and for you. ith you, lovingly listens to you and holds what is heard in confidence. 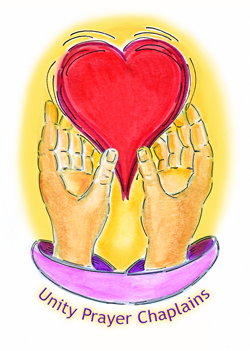 A Unity Chaplain is compassionate, available, nurturing, and accepting. The purpose of the Prayer Chaplain program is to create a congregation that feels cared for and connected. It is based on God as our Source. God is the center, head, and heart of all we do. There is nothing quite as comforting as being lovingly supported during times of challenge or crisis or even celebration. It is always helpful to have a hand to reach out to, a compassionate heart to listen and understand. A few caring words can bring inspiration to nourish your spirit. Unity Chaplains are NOT counselors, they don’t solve problems or judge. They simply hold a sacred space-- they listen, they pray.